This ancient surname recorded world-wide in over two hundred and fifty spellings, and including as examples Andre, Aindrias, Andrew, Anders, Jendrusch, Vondrak, Dandy, Andriol, Andretti, Ondracek, Vondraeck, Andress, Jedrzejewicz, and Andriuis, is of pre Christian Greek origins. 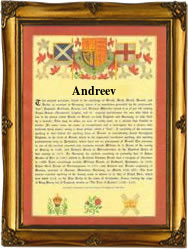 It derives from the personal name "Andreas", meaning manly, and was held by the first of Christ's disciples. Prior to the 10th century a.d., the name as a first name only, there were no surnames before the medieval period, was almost exclusively held by members of the church, one of the first of such recordings being that of a monk "Andreas", in the English Domesday Book of the year 1086. The name gained in popularity throughout Europe after the 12th century Crusades to free the Holy Land. These expeditions were largely unsuccessful, nethertheless it became the normal practice for returning soldiers to name their children after biblical and particularly Christian, saints or martyrs. St Andrew is the patron saint of both Scotland and Russia, and legend has it that his remains were brought to what is now the city of St. Andrew's in Scotland, in the year 900 a.d.. Certainly the name is very popular in that country. The surname was also one of the earliest settler names in America. Anthony Andrew being recorded in the first listings for the state of Virginia in 1623. The very first recorded spelling of the family name anywhere, is probably that of William Andreu, which was dated 1237, in the ancient charters of the county of Buckinghamshire, England, in the year 1237. Throughout the centuries, surnames in every country have continued to "develop", often leading to astonishing variants of the original spelling.